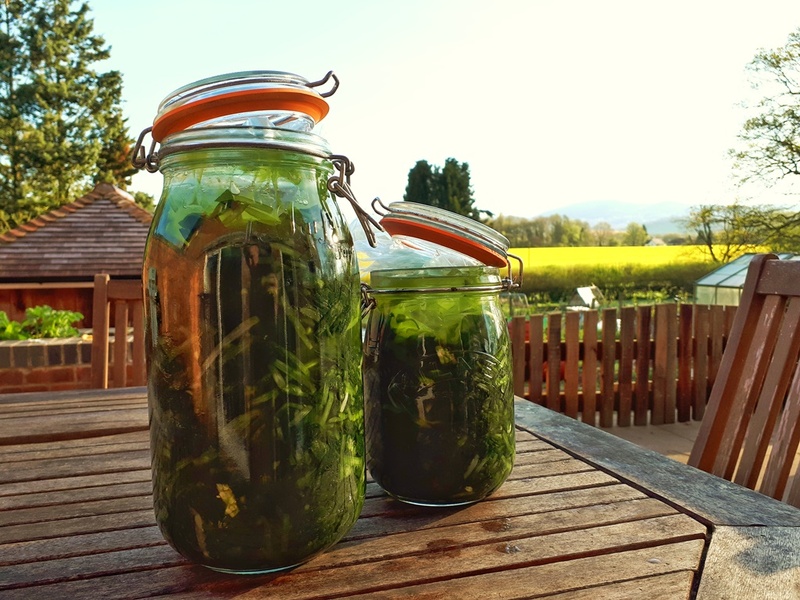 With so much wild garlic ready for picking at the start of the month I wanted to properly take advantage of it this year. I looked online and in a few books to see what else could be done with this wild harvest. One idea that really got me curious was to ferment it. 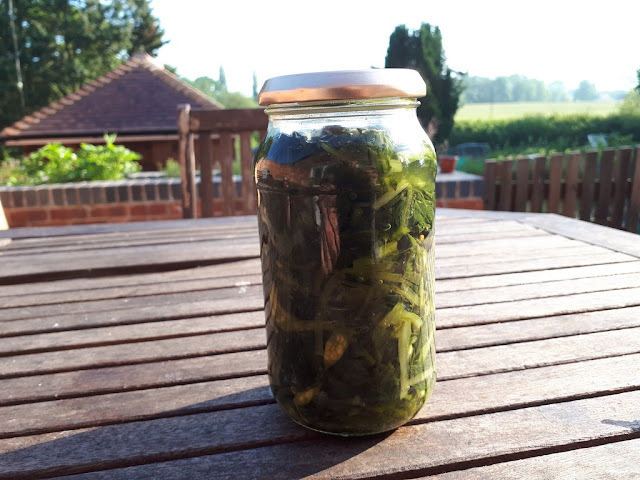 I've been wanted to try more fermented stuff and as I have a talk on preserving later in the year I thought that might make a useful bit of the talk! Another thing I really liked was how little of any other ingredients it used. 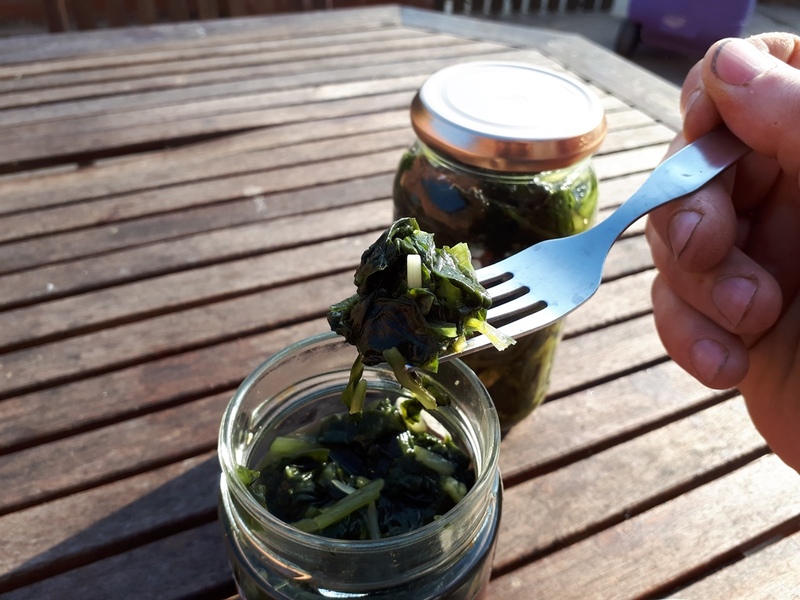 The recipes all used a bit of salt but not very much, great for being more off grid and sustainable if you haven't got to buy in loads of other items to make a preserve. I didn't really use any one recipe but more just got an idea of what I supposed to do then tried it. 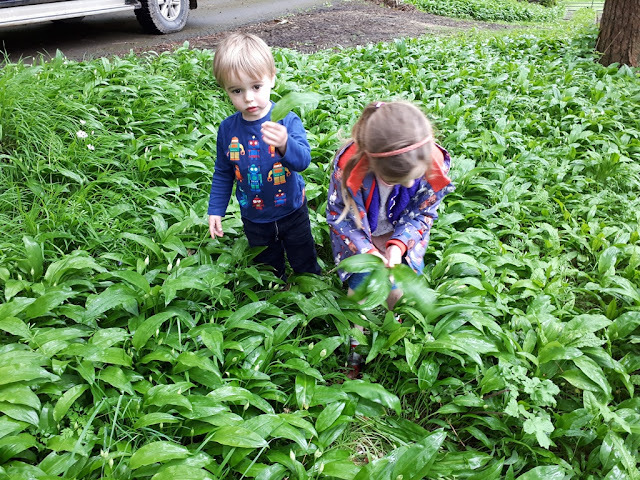 I went a bit mad with picking and ended up picking 3kg of wild garlic leaves and a few unopened flower buds. I washed these in the sink, but made sure I dried them off. Apparently the chemicals in the tap water might inhibit the fermentation process, next time I do it at my friends house where they have spring water! 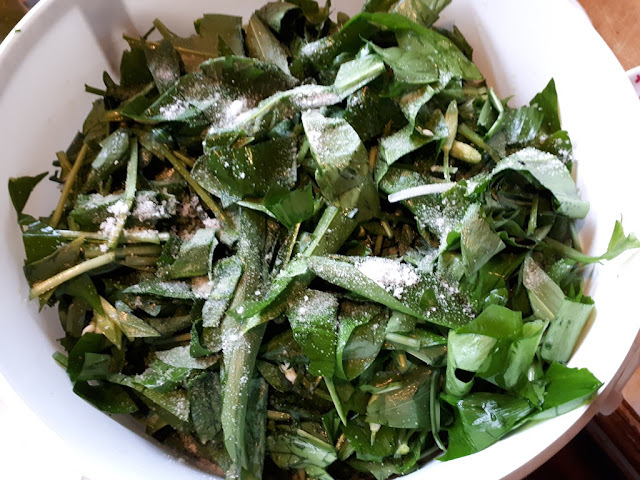 I then roughly chopped it and added 25g of salt for every kilo of leaves. I added the leaves and salt in layers until the bucket I was using was full. I then let it sit for an hour. When I came back the liquid within the leaves was starting to draw out. This is the bit to get your hands in there! I mushed the leaves up until I had enough liquid to cover all the leaves. After about 10 minutes of squishing I found a plate just smaller than the top of the bucket and pushed down the liquid so all the leaves were submerged. I then weighted it down with a jug of water and left it for 24 hours. I then transferred the rather strong smelling liquid and leaves to a couple of Kilner jars. The trick is to keep it all submerged so I filled a couple of freezer bags with water and added them to the top. This seemed to work well. Then ferment to taste. I have no idea what I like when it comes to fermented food so I just let it do it's thing for a few weeks. The first week it didn't seem to do much anyway. From the three kilos of leaves I got just the two jars in the picture above! I really goes to nothing! When the two weeks was up I put it into jam jars to be stored in the fridge, or in my case a cool shed! It's still fermenting so it might need to be opened to stop it exploding. When I tasted it I was surprised how good it was. Really lovely garlic flavour, really strong and still a little bit crisp but slightly salty. My wife did her usual when she tried it and was surprised it was so tasty - so little faith in my abilities! You certainly don't need much of it to flavour a meal, and it works great as a condiment. I'm looking forward to adding ti to soups as well. I'm just wondering what else I should ferment now! Who has some ideas and recipes? scapes... this is a popular eastern European food, they ferment a lot of food. I eat the scrapes but have never fermented them. they never make it that far they're so lovely! scapes are the shoots that garlic put out. these are ramps and you can find all kinds of recipes on my blog for them. they sell for almost 20.00 a pound here! they are wonderful. i made pounds of ramp butter and ramp pesto and froze it to use next winter. i am growing my own! That's mad how much it is, the stuff grows everywhere around here! A friend made peso but I think it needed some nettles as well - it was too strong! Well done. 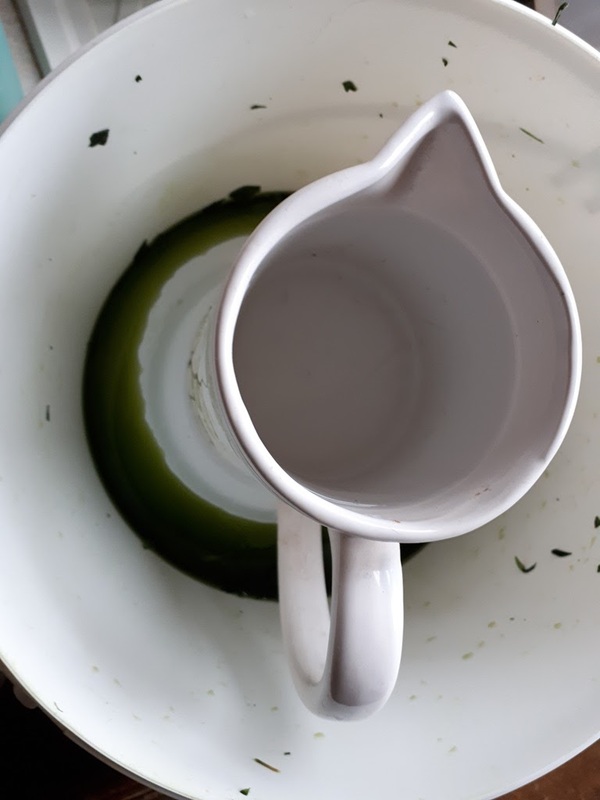 I can only imagine that the fermented wild garlic is not only tasty, but good for you, too. Yes, apparently all this fermented food is really good for us! I'll let you know when I turn 100! I probably undo all the good by all the sugar I eat! I bet you already know about this but just in case: It's Alive with Brad Leone, a series of videos on YouTube published by Bon Apppetit. Lots of great fermentation ideas and really fun for the whole family to watch. This one is about fermented garlic honey: https://www.youtube.com/watch?v=XLVxVQ8O0s4 Thanks for publishing all your interesting stories and photos! No I've not come across them before, I'm going to add it to my watch list - I'm always looking for something to watch - TV is so rubbish these days! Thanks for the link! Your wild garlic looks different than ours! And I think I like the look of yours better. Looks very tasty! It's interesting you should mention the salt. Most fermentation recipes call for a lot of it to deter the wrong bacteria from spoiling the food until it sours enough to protect itself. When I researched fermenting grain for our poultry, I was surprised that no salt was necessary. The key was to keep it covered with water until it began to bubble, indicating fermentation was taking place. So I surmised that the salt is just a precautionary measure for human consumption. I cut the salt by adding whey when I ferment foods. i think the salt in this is to help draw out the liquid and create the brine that it sits in. There are recipes with no salt so I will try those in the future, I love the idea of preserving whilst adding nothing to it! Oh I would so love to have some wild garlic! Doesn't seem to be any round here. I read a blog called the Zero Waste Chef at https://zerowastechef.com/. 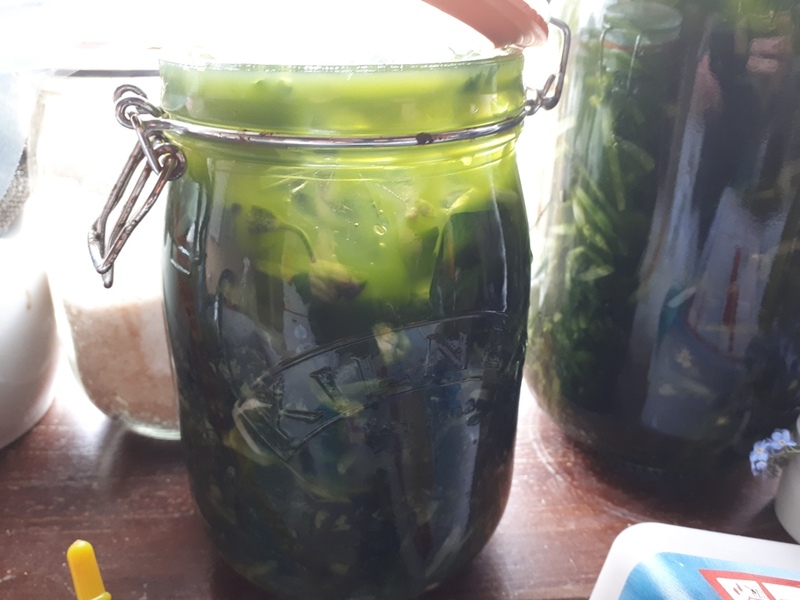 She is very keen on fermenting and has written lots of articles on it. Might be worth a visit to her site to see if any of the articles are of use to you. Thanks I'll look it up - sounds just like my kind of thing! I ferment veg all the time. Sauerkraut and kimchi are my favorites. I swear by them for good health. I only use 2 teaspoons of sea salt to 2lbs veg. Ferments are an aquired taste but once aquired you crave some everyday! Yeah, that's about the same amount fo salt that I used here. I'd love to make a kimchi - do you have a fail proof recipe that you use? I love making kimchi, but cabbage is not everyone's thing. I suggest carrots. Super easy to do and it is the only fermented veggie my daughter will eat (she loves kombucha though).